Radioactive materials and depleted uranium (DU) have been widely used in many medical and industrial applications for many years. Our service is to recycle the unwanted gamma sources and DU for re-use for many different types of applications. This is accomplished by the DU being: cast, rolled and/or machined to make products such as radioactive materials transport containers, sheets and cylinders. This is carried out in special recycling facilities. The technology we use for closed source recycling requires re encapsulation sources with other existing sources within a new capsule in a specialized and controlled environment ready to be reused. Gamma Service has been recycling Depleted uranium for more than 10 year. Recycling is the best answer to the ever-growing amount of unwanted radioactive materials. Governments, industries and commercial companies are all seeking to reduce the size of the unwanted radioactive materials by re-using or recycling, furthering their involvement in helping the environment. Depleted Uranium (DU) is used in many different industries for a number of different applications. Many companies use DU for shielding for radioactive devices. Because of the fast growing nature of technology, depleted uranium is becoming more obsolete. Therefore leaving many companies, hospitals and organizations with unwanted materials that must be dealt with, following all health and safety regulations. Gamma Service offers and excellent method of recycling DU. Recycling of DU has now advanced successfully. This means all the DU companies have stock piled for many years, can be removed and recycled safely by Gamma Service. DU is recycled by Gamma Service following all UK and international guidelines. Gamma Service have a long experienced knowledge in the handling and recycling of Depleted Uranium. Gamma Service specialises in the supply, removal, recycling and transportation of high activity Co-60, Cs-137 sources and depleted uranium. The transportation of the radioactive sources is carried out in specifically designed transport containers Type A and B(U). Gamma Service are experts in the removal and recycling of depleted uranium from all medical and Industrial applications. Our engineers are trained on all manufactured models of therapy units and industrial irradiators. We provide our customers with an exemplary service for installations, removals, maintenance, repair and dosimetry for Gamma Biological Irradiators. Gamma Service has the best technologically advanced devices for all consumer needs. Gamma Service provides to the highest forms of quality and safety management in the transportation of radioactive material. The transportation containers Type A and Type B(U) are specially designed to hold radioactive materials and sources. 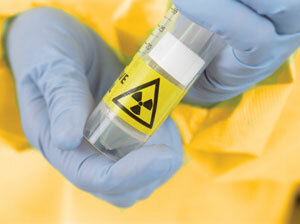 Offering the best in specialized transport services, we follow all regulations for transporting radioactive materials. All transportation for Gamma Service biological irradiators are carried out with the same prowess and example for all our services. Gamma - Service Recycling GmbH, our partner company, is managed to the quality guidelines of ISO9001: 2000. The quality management system is in accordance with the requirements needed for the handling of radioactive substances. They follow the regulations of Atomic Law and the GIPO. The exportation is controlled by the Federal Agency of export and economic control. This is the authority which controls the transportation of radioactive materials. We follow all regulations and necessary insurances required for the international transportation of radioactive substances, to ensure of a high customer service for any of our services or products! Therapy sources contain Co-60 radioactive materials that are secured within specially designed source holders for use in a large variety of fields. The diagnosis and the treatment of patients for the healthcare industry. For Research and education in the healthcare industry (e.g. universities, Cancer Research). In industries that use sources (recycled radioactive sources) for the instruments and gauges used for determination of various materials. For specialist equipment used by the government and defense organizations. These Co-60 sources require supervisory management to follow regulations for the whole of the sources lifespan. Gamma Service continue to follow all regulatory guidelines so that the sources are recycled or disposed of correctly and safely. The experience established by Gamma Service with the handling of radioactive materials helps us provide professionally trained employees for specialist support through the processes of recycling of these therapy sources. In the case of a company having insufficient data to give us for the recycling or disposal of radioactive sources, Gamma Service engineers can visit your location to evaluate the surplus radioactive sources. More and more companies have to manage their radioactive sources with their own recycling targets in place. Gamma Service is one of the leading companies to deal with the recycling of radioactive sources, unless the source is not suitable for recycling then it will be disposed of in UK based specifically designed facilities. Gamma Service enables comapanies to either dispose of or recycle their surplus stocks. Our service is in keeping to the highest standards of safety and the highest standards in quality management.